Excitement is building as in 2018 Cornerstone will play host to Cardiff’s first Poetry Festival. 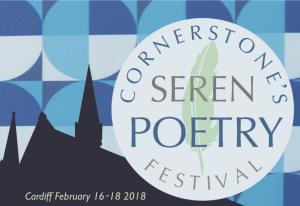 Cornerstone’s Seren Poetry Festival will take place over three days in February 2018 showcasing the artistic talents of poets from across Wales. During the festival audiences will be treated to poetry readings, films, music, art and celebratory lunches bringing the poetic arts to life in our magnificent building. Guest artists include Costa prize winning poet Jonathan Edwards, Paul Henry, Brian Briggs, Philip Gross, Cyril Jones, Damian Walford Davies, Rhian Edwards, Gillian Clarke, Gwyneth Lewis, Richard Gwyn, Clare E. Potter, Susie Wild, Emily Blewitt, Katherine Stansfield, Stephen Payne, David Foster-Morgan, The Spoke, Little Red & Robert Minhinnick. One of the core focus points when we started the Cornerstone project was to provide a cultural hub for the city of Cardiff. Working in partnership with Seren Books we look forward to what promises to be a wonderful three days here in the centre of Cardiff. Further information about the festival and ticket bookings are being made available via RCADC website. To visit the site click the button below.